Implementing no rating performance appraisals can be a bit of a no-brainer when you consider the downsides to traditional performance appraisals. Having said that, if you want to successfully shift to a no-rating performance assessment, be prepared to do quite a bit of pre-work. What do we want from a performance appraisal? The goal of any performance process is to inspire people to improve their own performance and consequently business results. Specifically, you want both individuals and your organization to be more agile, anticipating changes and responding effectively and efficiently to the disruptive nature of our world. 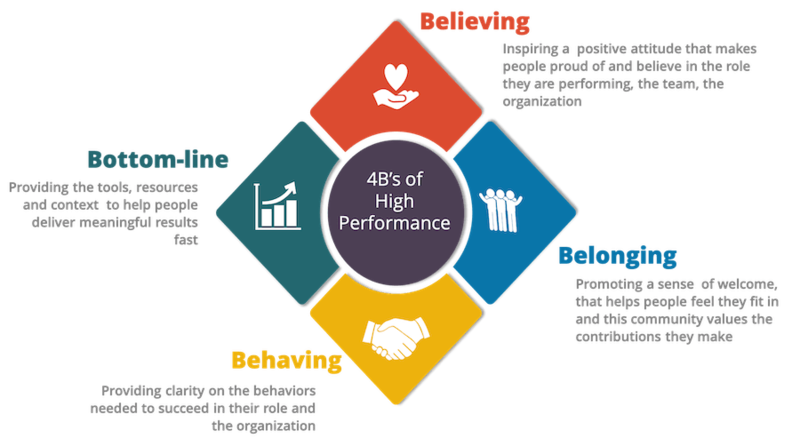 Moreover, you want to ensure that the 4Bs of high-performance are being enhanced. Traditional performance appraisals are fundamentally flawed. The problem is the traditional performance appraisal generally puts the brakes on achieving those types of results. Because the traditional performance appraisal process is fundamentally flawed. It actually sets up the conditions that create under-performance and a culture of low-performance/low morale! Certainly not something anyone would aspire to. The psychology of managers standing in judgment of employees, rating their performance against some arbitrary scale, pointing out their flaws, goes against everything we know about high-performing individuals and organizations. 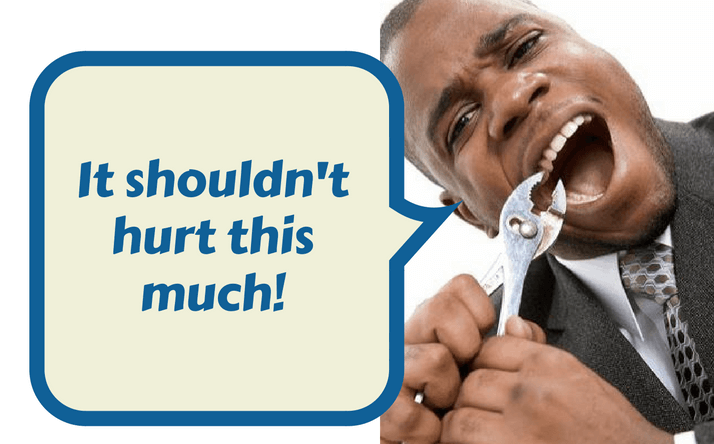 Performance Appraisals are often painful for everyone! Humans are hardwired to watch out for threats .. for pain and danger. Because of this hardwiring there's two things we do, that's almost impossible to control. First we jump to conclusions and secondly we assume the worst. Which back in the caveman days was a good thing ... it kept us alive. Assuming that rustling in the bush is something trying to eat us, kept us alive! And that's the problem. Our emotions run us and we are running on outdated software! You may like to think you're rational, but mostly you're not. And, so when your boss starts to tell you that you are "Meeting Expectations" or "5/10 on the scale" you instinctively see that as a threat. A threat to your self-worth and your standing ... because most people like to see themselves as more than average. In fact, this is a phenomenon known as Illusory superiority. Psychologists see this happen in their studies all the time. Ask people to rate how they drive and most people will rate themselves as above average. In this study found 80% of people rated themselves above average as drivers. Calling someone average is like saying there's nothing special about you. When people hear that, instinctively, they stop listening and start girding up to defend themselves. And depending, upon their degree of emotional intelligence things can rapidly get ugly. Neuroscientists from the University of Chicago (Cacioppo) and Ohio State University (Ito) have been able to demonstrate that our brain is hard-wired to react more strongly to negative information. Which is exactly why most managers say that performance appraisals are the task they dislike the most … why? Because when people are judged average or lower they often become defensive and/or aggressive. This then puts the Manager in the dangerous place of having to defend his or her judgments. Of having to defend the rating of ‘acceptable’ rather than ‘outstanding’. Agonizing over whether someone is a ‘valued performer’ rather than ‘outstanding performer’, takes up too much time and puts the focus in the wrong place. Most people walk out of a performance appraisal session deflated, not inspired. This has an immediate deficit impact on their performance and they are likely to spend hours grumbling and groaning to themselves, their colleagues, and their family about how nobody appreciates them and their effort. We need to stop this circle of destruction. In fact, there's plenty of research around that confirms that performance appraisals actually cost more than any benefits. You get lost time as people fuss and fume over their ratings. Hours of leaders, both an individual's direct leader, their HR team and their more senior leaders reviewing the appraisal. In fact, Adobe realised that their annual review required 80,000 hours from the company’s 2,000 managers, equivalent to 40 full time employees per year (see this article for more). Because ultimately what are you trying to achieve with a performance review? To stand in judgment? Or to improve performance in the future? If it’s the later then the traditional appraisal process isn’t your tool! What we need to do is to shift the conversation from a Manager sitting in the Judge role, affixing bland and more to a coaching role, where the leader and the team member are focused on what they can do to enhance their performance. The key to getting people to perform closer to their potential and not be strung out by a review of their performance, is to guide the feedback recipient to self-awareness and self-discovery. Helping them to review where they’ve been, but most importantly getting them focused on future performance. When you are “future-performance focused”, what is most important is the conversation – not the rating. Getting rid of the labels and rating system gets people more focused on identifying and developing talent and removing barriers that have got in the way of performance. Go for feed-forward rather than feedback. Even more powerful than feedback is feed-forward. None of us can go back in time and change the past, so feed-forward makes a whole bunch of sense. And most importantly, it takes away the barb of feedback which can get taken personally. An individual can’t take personally something that has yet to happen! Ask for permission to coach up if you see them not using the skills/behaviors/capabilities they are trying to instill as habits. Point 4 is critical. Nothing, is more important than the regular on-going performance discussions/coaching sessions you have with your team members. Regularly review how they are tracking against their goals. Keep them focused on what they’re doing well and what they need to improve. The more you can get people to self-reflect, the stronger their performance and the less you’ll need to manage. Rather than calling it Performance Appraisal or Performance Review, give it a different name. (The way you language things is very important. Who would you rather work for a supervisor or a leader? Quite different pictures come to mind right? Think of the picture that comes to mind when you say performance review or performance appraisal vs performance growth. FYI: One of my client calls their system "My Success Program" and another "Performance Growth". As a minimum, make sure you have these items in place before launching a no-rating performance feedback system. Have a good goal alignment process in place. There should be a clear line of sight between the organizational goals and an individuals goals. One of the programs I've used to help organizations move toward a high-performance mindset culture is Thought Patterns for High Performance. Come across and take a sneak peak at how this transformational program could work for you. Feel free to email me if you'd like more information on the program (we have facilitators around the globe). I highly recommend that you consider this program as one of the tools to get your leaders and team members ready for high performance and no rating performance appraisals. Teaching a business owner mindset to your team members, sets them up for taking self-responsibility for their success. You can find out more about this mindset in this free video training. If you want to go into greater depth you can download the entire course. In the course there are also self-assessments that you might like to think about for your performance review system. Self-assessment and regular one-on-ones throughout the year are key to this system. Once your team members have the mindset of high-performance employees (see the link above) - this makes this process a lot easier. Here is a a program about one-on-ones. I encourage you to ensure that this system of regular 1-on-1s is working well in your organization BEFORE you go to no ratings appraisals. A culture of regular (weekly/fortnightly) performance discussions means the annual conversation becomes more about growth and development than looking in the rear-view mirror at past performance. If an individual is under-performing you would have been handling that using a different process. Below are some documents you can use to help you present a new no-ratings performance appraisal system. Firstly there is a pdf called, "My Success Performance Growth". In it you'll see two examples of forms that each of these clients chose to use for their programs. It is important to note that both systems are based on the Solutions Focus coaching model - which we had taught leaders some months before moving over to the new system. If you haven't used Solutions Focused Coaching before, you can find out a bit more about it here. The forms I've shared with you are the ones we used with leaders. The first form (page 6) you will see highlighted the words "engaging and inspiring people" you would swap those words out for each behavior/criteria you want the team member to review. My recommendation no more than 5 key behaviors/criteria. The Powerpoint and Keynote are both the same document (just giving you options for your preferred software). These may be useful as you think about presenting to key stakeholders your aims in shifting to no-rating. Please note. I have purchased all the images in the presentations, however, that DOES NOT give you the right to use them. If you use them you are likely to come unstuck with copyright laws. You need to source your own images. I've includes some very brief comments in the notes section of the presentation, which should help you with context for each slide. But to add a bit more clarity here are some extra notes. Slide 2 - is to remind participants of the goal alignment process that we had previously put in place. You can find out more about Goal Alignment here. You probably already have something similar in your organization. Between Slide 3 and 4 is a hidden slide that helps to model out the HR functions - again this is likely something that you will have already covered with your leaders and team members, but I've added it in there, just in case. Slide 5 shows the three elements you should have in any performance agreement with an individual. Slide 14 switch out the $50/hour for whatever is the average employee hourly rate in your organization and the number of employees to make the slide work. Between slide 28 and 29 is another hidden slide. Which is just a bit of map of the relationship between learning and the various HR elements it impacts upon. You may or may not find this useful. I wish you well, it is an exciting adventure and one that you and your leaders will love, once you get all your systems in place to support it. So much more engaging and empowering for everyone!